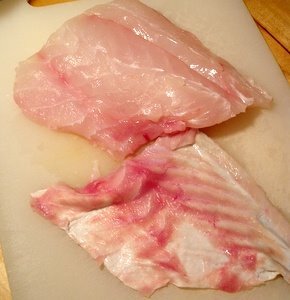 Valyn, one of the students from my fish class, just e-mailed me with a question of how to skin a fish fillet. This had “Technique of the week” written all over it. Thanks so much for the idea, Valyn! 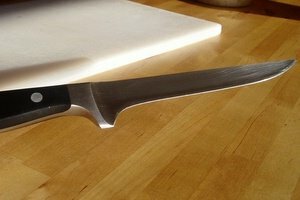 You’ll need a sharp boning knife (see the picture) or a utility knife that has a flexible blade (no picture since I don’t own one). Put your fillet on the cutting board skin side down with the tail end on the left and the head end on the right (or the other way around if you are left handed). If you have a small piece of the fillet that is of equal thickness throughout (like you see in this picture, the orientation of the piece doesn’t really matter. 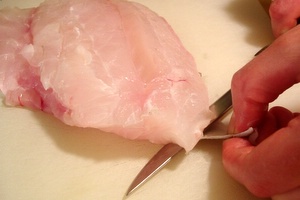 Make a cut to separate a small flap of the skin from the fillet in the left corner that's closest to you (or right corner if you are left handed). Grab onto that flap, and slide your knife between the skin and fillet pointing the blade of your knife slightly into the board (about a 20 degree angle). This way you'll leave the least amount of fish on the skin. Slide the knife all the way under the fillet. 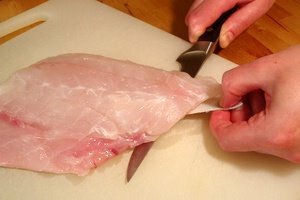 Skinning a fish steak, like swordfish, is even easier. Place the steak on the cutting board, flat side down. Slide a knife between the flesh and the skin and work your way around the steak. All the recipes on my blog specify whether to use fillet with or without the skin. But in case you are curious, here are some skinning guidelines. If you are browning your fish in the skillet, on the grill, or under the broiler, the skin will turn deliciously crispy, so make sure to keep it on. Some of the fish with great tasting skin are salmon, arctic char, striped bass, black bass, Mediterranean bass, sea bream, red snapper, trout, and bluefish. An exception to the above rule is dense fish, like swordfish, tuna, marlin, mahi-mahi, and grouper. Their skin is too tough and should be removed no matter how you are cooking them. Thanks for another excellent demonstrations! Sometimes it can be hard to hang onto the skin with your bare hand. If that happens, a paper towel seems to help. Thanks for the technique, Helen! Very helpful! A disciplined way to skin the fish indeed. But as you have pointed out that there can be more than one way to skin fish I would put down the easiest one here. You have to pinch the skin at the tail end of a whole fish, to slide the knife between the skin and the flesh. After sliding the knife to three inches, slit the skin a bit along the axis place your finger in that hole for grip and then rip off the skin from the meat. Thanks for the tip! I love the idea of making a hole in the skin to make it easier to hold on to. I've never tried just ripping the skin off the fish. Do you flip the fish the skin side up before ripping off its skin? Does it come off without ripping the flesh? I am glad that you founf the tip useful. Yes you have to flip the fish and then pierce a finger into the hole so that you can hold the fish firm while smoothly ripping off the skin on the other side. Yes, I have a perfect technique for filleting a fish -- ask your fishmonger to do it for you :) Mine packs the heads and bones in one bag and fillets in another for me. In US, fishmongers don't charge for this service. If you want to learn to do it yourself, get James Peterson's Fish and Shellfish book. It provides great illustrations. But realistically, no home cook I know does it enough to get really good at it. so when you say to leave the skin on the salmon, does that mean you cut it off and then put it back on for when it's in the oven or that you do not cut the skin from the fish period? thanks in advanced for all of your help! If you are going to eat the skin, leave it on the fish. If you are grilling or searing salmon, the skin will get crispy and taste very good. If you don't like it, you can always take if off when serving. The technique I am showing here is only necessary for fish whose skin is too tough to eat (mahi, grouper, sable, etc). Hi, regarding salmon skin... is that where all the omega 3 is?? I like to keep the skin in the pan longer and really crisp it up. Nutritionally, is that good for you or is it too much oil??? I keep the skin on because it tastes good :) That's not where "ALL" the omega-3 fatty acids are. 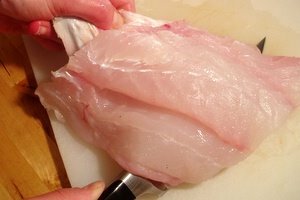 They are anywhere the fish fat is, and there is plenty of fish fat all throughout the fillet.